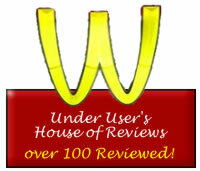 The House of Reviews is open! A list of all the reviews I've done. Ever. I think. Links in bold went on to be featured. None whatsoever. For the first month in nearly 2 years. Sad, I know. Why? :Don't You Get a Job? UnBooks:Hot Japanese Girls - Colourblind or Unable to Speak English? Pripyat River - was featured, but only after the version reviewed was reverted back to the good version. Why? :Is a raven like a writing desk? This page was last edited on 22 January 2010, at 18:15.